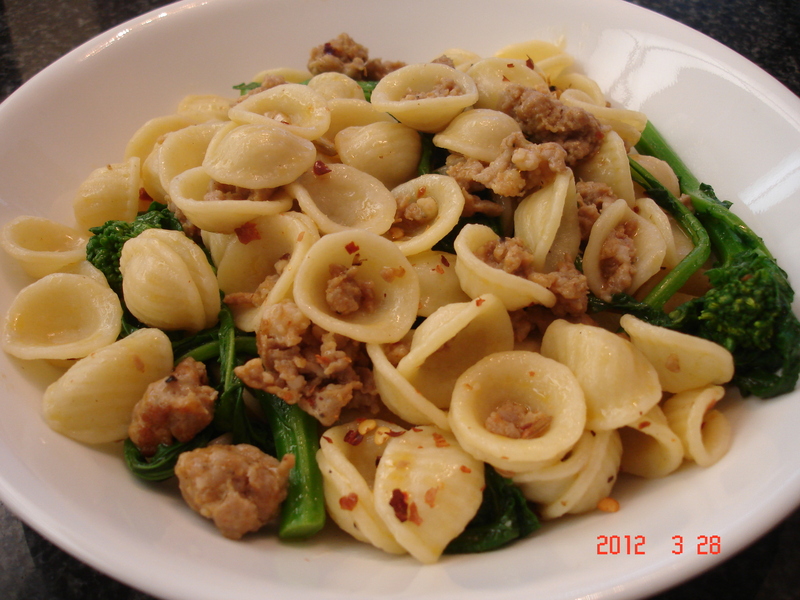 The last time I went to an Italian restaurant in NYC, I ordered orecchiette with hot Italian sausage and rapini. It was delicious, but unnecessarily pricey. So, I recreated it when I returned home. This pasta dish is easy to make and elegant enough to serve at a dinner party. You could serve it as a starter or as the main dish. Bring a large pot of water to a rolling boil over high heat. When the pot of water reaches boiling point, add a large pinch of salt to it. Then add the pasta to the boiling water. Cover the pot with the lid until the water returns to a rolling boil. Then reduce the heat to maintain a gentle boil with the pot uncovered until the pasta is cooked to al dente or desired softness (personally, I prefer pasta that is softer than al dente). Follow the cooking instructions found on the pasta packaging for guidelines on cooking time. (Note: Be sure to add the rapini approximately 2 minutes prior to the end of the cooking time. See below for further instructions.) When you drop the pasta into the boiling water, start heating a large, heavy bottomed saute pan over medium high heat. When the pan is hot, but not burning, add a few light drizzles of olive oil. Once the oil is heated, add the sausage meat and and cook, stirring occasionally until the meat is browned on the outside but still pink in the middle. Be sure to break up the larger pieces using your cooking utensil. (Note: If your pan is hot enough when you add the oil, it will only take a few seconds for the oil to get hot, so be careful not to burn the oil. If you do burn the oil, discard it, wash the pan, dry it completely and start again.) Then add the garlic and a small pinch of hot chili flakes (or more to taste) and cook, stirring frequently, until the sausage is cooked all the way through. Remove the pan from heat until the pasta is done cooking. The goal is to finish cooking the sausage right before the pasta is done. About 2 minutes before you anticipate your pasta being done, turn the heat to high and add the rapini to the boiling water. Once the water returns to a rolling boil, taste test one of the pieces of pasta to ensure that the desired softness has been achieved. By the time the pasta is done, the rapini should be cooked through as well. Try not to overcook the rapini. It should be tender but still crisp. Immediately strain the pasta and rapini out of the water and add it to the cooked sausage in the saute pan. Add sea salt and black pepper to taste and toss the pasta with lemon zest (if using). Drizzle and toss in extra virgin olive oil until the desired amount of flavour and shininess is achieved. You want the pasta to be smooth and to not stick together, but you don’t want it to feel or taste oily. Serve immediately and, if desired, garnish with finely grated parmigiano reggiano. Hi Alison, sorry to hear about your concussion, but it’s great that you’re finally on the mend. This pasta dish looks easy to make and tasty! Just the thing for a fast weeknight supper. Hi Cathy! It’s so nice to hear from you! Thank you for writing 🙂 Hope you’ve been well!